Every new beginning comes from some other beginning's end..
Semisonic is a power pop/alt rock band formed in Minneapolis, Minnesota, USA. Band members are Dan Wilson (guitar/vocals), John Munson (bass), and Jacob Slichter (drums). 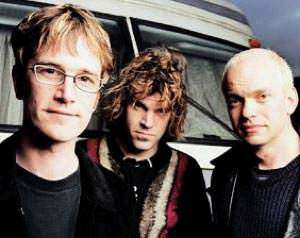 After the breakup of Trip Shakespeare, Dan Wilson and John Munson joined up with drummer Jacob "Jake" Slichter to form Semisonic in 1995. An EP, Pleasure, was released that year and the studio full-length Great Divide in 1996 on MCA. .